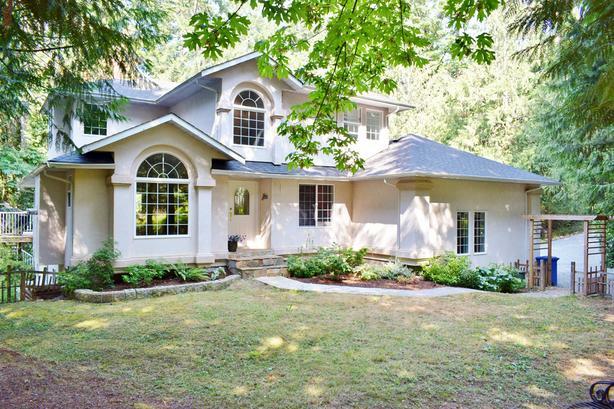 Situated on 1.83 private acres in Mill Bay this solid family home backs on to Shawnigan Creek & has its own swimming hole & beach. With 3,986 Sq. Ft., 6 bdrms plus den & 4 baths, including a 2 (or 3) bdrm lower level suite, there is room for everyone here! A few features of the main level entry home include an open concept kitchen/family room w/ BBQ deck, large kitchen island w/granite counters, wood cabinets, living room w/built in book shelves, master w/walk-in closet & ensuite, cozy wood stove, 2 propane fireplaces, dbl garage & more. The suite is open concept & has its own patio w/covered area. There's also a 413 Sq. Ft. studio building, ready for your ideas. Mostly treed & natural w/a fenced front yard, lovingly maintained & numerous recent updates such as hot water tank, brand new roof, newer pump for the septic & some paint. Close to hiking trails & the amenities of both Mill Bay & Cobble Hill as well as an easy commute to Victoria. An amazing place to raise your family!